Personality: A very silent and shy person, but when she gets to know somebody she can be rather talkative and cheerful. Kekkei Genkai: Ability to control and use the sand element, the sand responds as an armor and will naturally protect it's master. Name: Suna no Tate, 砂の盾, literally "Shield of Sand"
Regardless of her own will, this jutsu automatically surrounds and protects her from incoming attacks. Capable of withstanding considerably strong attacks and projectiles, this sand shield can become stronger than steel. It can be defeated by avoiding it completely with extremely high speed attacks, or merely overcoming the shield with incredible brute force. Name: Daisan no Me, 第三の眼, literally "Third Eye"
A floating eyeball is formed out of sand. Its main purpose is to allow the user to spy and observe what's going on outside when she uses her sand-sphere defense. Name: Saikō Zettai Bōgyo: Shukaku no Tate, 最硬絶対防御・守鶴の盾, literally "Extreme Hard Ultimate Defense: Shield of Shukaku"
A highly powerful defense technique in which she summons a small sand sculpture of Shukaku which blocks any type of attack. Though this technique requires a lot of chakra it does make a very powerful defensive technique. Name: Fūton: Mugen Sajin Daitoppa, 風遁・無限砂塵 大突破, literally "Wind Release: Infinite Sand Cloud Great Breakthrough"
The user spews a large amount of sand from the mouth, that covers a large area. The sand strikes the opponent, and devastates both the enemy and a large area around her. Name: Gokusamaisō, 獄砂埋葬, literally "Prison Sand Burial"
The ground quickly loosens below the opponent and causes everything in the area to completely sink hundreds of meters deep within the earth. By being imprisoned at this depth, the pressure on the opponent will immobilize their ability to even move a finger. Name: Sabaku Fuyū, 砂漠浮遊, literally "Desert Suspension"
Using the sand that she carries on her back, she is simply able to stay afloat up in the air with the sand she controls at her will. Name: Sabaku Kyū, 砂漠柩, literally "Desert Coffin" Viz "The Coffin of Crushing Sand"
This Jutsu uses sand to grab the opponent and cover their entire body. This skill is primarily utilised for apprehending an opponent immobile, but can kill the opponent by suffocation or by being followed with the Sabaku Sōsō. Name: Sabaku Sōsō, 砂漠送葬, literally "Desert Funeral" (a.k.a. "Desert Graveyard"), Viz "Imploding Sand Funeral"
Through the will of the user, the sand already wrapping a target because of Sabaku Kyū will implode and crush whatever is within. When used to kill a person, the death is so quick that there isn't even time to feel pain. It should be noted, that, in Gaara's battle with Rock Lee in the Chūnin Selection preliminaries exam, Gaara crushed Lee's left arm and leg with just Sabaku Kyū, without any sign of using Sabaku Sōsō, perhaps implying that Sabaku Kyū itself has its own crushing effect. Name: Ryūsa Bakuryū, 流砂瀑流, literally "Quicksand in the Style of a Waterfall"
This technique moves sand in the likeness of an ocean wave towards the enemy, covering and "drowning" them in an ocean of sand. Name: Sabaku Taisō, 砂漠大葬, literally "Desert Imperial Funeral"
Name: Sabaku Rō, 砂漠牢, literally "Desert Prison"
This jutsu uses sand to imprison the victim. Name: Suna Bunshin, 砂分身, literally "Sand Clone", Viz "Sand Doppelganger"
Creates an identical copy of her, except in sand form. When it is attacked, it does not disappear like other regular clone techniques. Instead, it can transform parts of itself back into sand in order to snag and attack the opponent. This makes it one of the strongest and most advanced types of clones. Only after it is damaged enough to the point of destruction, it takes on the form and appearance of regular sand. Name: Suna no Yoroi, 砂の鎧, literally "Armour of Sand"
This jutsu uses chakra to cover the user with a thin, but very dense, layer of protective sand. While a good defense, it puts an unignorable burden on the user's stamina, both through chakra absorption and the fact that the sand makes them heavier and hampers their movement. Name: Suna Shuriken, 砂手裏剣, literally "Sand Shuriken"
Shuriken made of sand are shot at the opponent. Name: Suna Raishin, literally "Thunder God of Sand"
She then creates several lightning rods made of sand and spread them through the battlefield. Once they are activated, the rods absorbs any eletricity nearby and use it to shock the enemy. She is able to turn her sand into almost any shape, a giant spear, a giant ball, other people, etc. 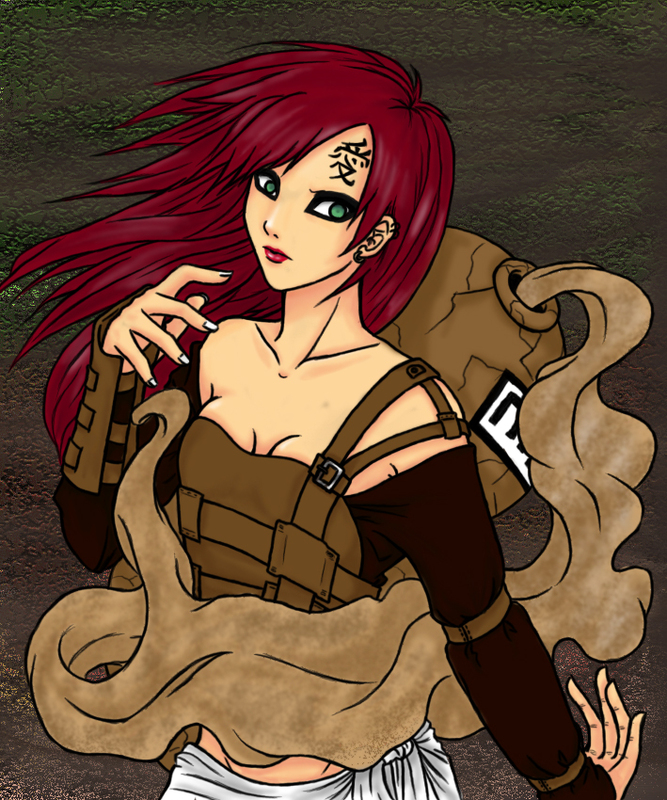 History: Kisaki is a descandant from Gaara, unlike Gaara she does not have the Shikaku spirit with in her, allowing her to be a more peaceful and relaxed person. She was raised and trained by her parents, mainly her father who is the Kazekage. Kisaki was very gifted with sand control, even as an infant she could use it extremely well. She was a child progidy, her father said that she was more like Gaara than he had been, therefore she had the potential to become a much greater shinobi then he was. She now serves as a messenger for Suna and Konoha, she is rarely escorted since she is believed to be one of the most powerful shinobi in Suna. Ok, approved, only thing I need to ask is. I second that approval and I'm pretty sure she's good.